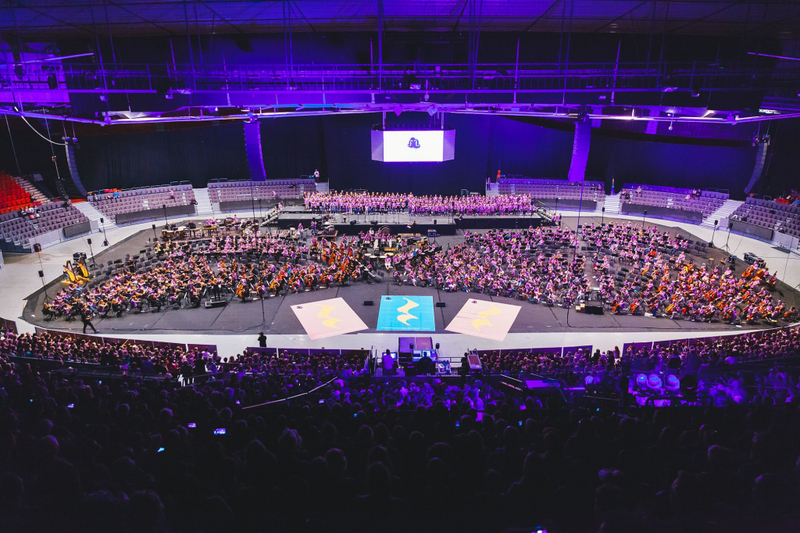 Once the final note sounded at the Side by Side music camp’s major festival concert in Scandinavium, it was easy to understand what it means to have a camp for a better world. Supporting El Sistema is a part of the Swedish Exhibition & Congress Centre’s sustainability work, which in turn supports the Group’s vision to become Europe’s most attractive meeting place by offering the best total experience. “A total experience includes sustainability, but also participation, belief in the future and creativity. El Sistema and Side by Side stand for all of that,” says Carina Dietmann, head of communications for the Swedish Exhibition & Congress Centre Group. According to the UN Convention on the Rights of the Child, all children in the world should have access to cultural and artistic activities. “We want to support children and young people who want to play music, to give them access to music and culture in their daily life. El Sistema shares the joy of music with our guests during their performances with us, which take place several times a year,” says Carina Dietmann. Visitors can feel secure in the knowledge that the Swedish Exhibition & Congress Centre and Gothia Towers take responsibility and pursue sustainability initiatives that permeate the entire operation. This includes energy consumption, organic food, and chemicals, as well as accessibility and environmentally friendly transports. And of course: social engagement. “We want to focus on local projects that have a global impact and thus make the world a little better. With 1,800 young musicians from all over the world, together we can spread joy, creativity and a belief in the future that everyone can bring back to their home countries. That contains an enormous amount of positive energy,” says Carina Dietmann. In addition to the collaboration with Friends of El Sistema in Gothenburg, the Swedish Exhibition & Congress Centre and Gothia Towers also work with other organisations, such as the Rescue Mission of Gothenburg. The Rescue Mission’s vision is that all people have the right to a dignified life. They work with homeless and socially vulnerable populations, integration and children whose parents are imprisoned. Since 2015, the Swedish Exhibition & Congress Centre has supported the Friends of El Sistema in Gothenburg, an association that supports and inspires the development of El Sistema in Gothenburg. Through El Sistema, about 1,600 kids in the Gothenburg area receive training in a variety of instruments and singing. El Sistema is a worldwide movement that harnesses the power of music to help people influence their lives for the better. The operation was founded in 1975 in Venezuela and currently exists in 65 countries. Hammarkullen in Gothenburg was first in Sweden to hold trainings in accordance with El Sistema’s method. learn the basics and then immerse themselves in a playful and serious way. The kids meet several times a week to play and sing together. El Sistema can be found in many places in Sweden, but has a shared repertoire. This way, the orchestras and choirs can meet up and play and sing together, like at the big music camp, Side by Side. El Sistema works with several professional orchestras in Gothenburg, including the Gothenburg Symphony Orchestra.